One of the greatest benefits to the APR K04 turbocharger system is its simple, yet elegant design. APR's CNC machined direct compressor recirculation port on the OEM compressor cover significantly reduces engine bay clutter and saves the end user from the hidden costs of purchasing extra throttle body pipes, hoses, clamps and DV mounts for recirculating boost pressure. The compact design also removes extra charge piping volume to allow for lightning fast boost response and less locations for boost leaks. Furthermore, charge air pressure is directed directly at the compressor wheel which helps keep the turbo spooled upon lifting the throttle, minimizing turbo lag. The OEM k04 turbocharger features a turbo muffler designed to reduce turbocharger sound in the cabin that also creates a restriction in the boost pressure delivery stream. 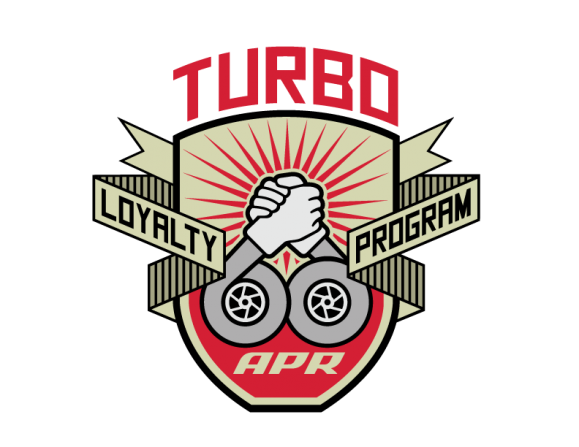 APR removes the turbo muffler not only to enhance the sound of the turbocharger, but also to smooth the airflow across the previously baffled muffler section. This also eliminates the need to Purchase an OEM S3 turbo discharger pipe. A clean and simple CNC flange developed by APR's Engineering Team is bolted directly to the compressor cover in place of the OEM turbo muffler. A long mounting surface provides an excellent slip proof surface for mounting the silicon discharge hose and an o-ring between the flanges ensures a life of leak proof operation. *It is essential to ensure your vehicle is filled with at least the minimum octane rating for each Performance Calibration when activating the program. Installation can be performed at any APR Dealer and all parts necessary for the installation except for fluids are included. An APR Intercooler is required. An APR Race DP is required. Note: APR K04 Software, APR High Pressure Fuel Pump and OEM Bosch K04 Injectors ARE REQUIRED! ¹ Power levels from this kit may be too high for a stock Tiptroinc transmission. APR highly recommends transmission upgrades to support these power levels.